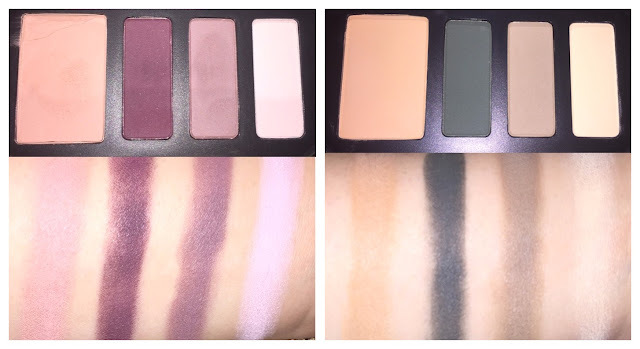 Swatches: I only ended up purchasing two of the four palettes in this collection (Plum and Sage). I'm not the biggest fan of dark colors on my eyes and I have an old KVD palette that has colors similar to Rust. 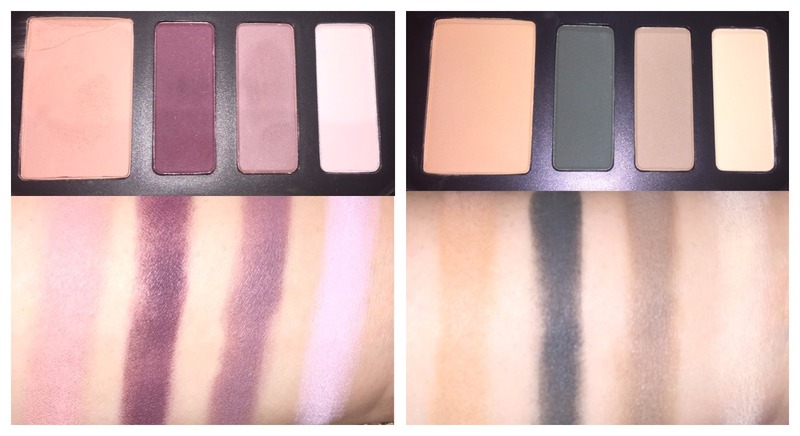 Verdict: I actually really ended up loving these palettes. The shadows are so buttery and blended beautifully. I ended up using the Plum palette to do my eye makeup on my birthday :) The shadows had great staying power, as well as, pigmentation plus I think the colors are beautiful. 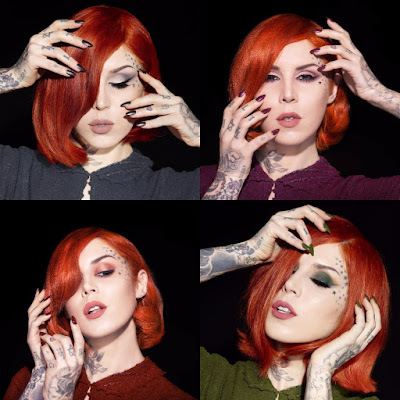 I would definitely recommend these new eyeshadow palettes from Kat Von D plus the price won't break the bank either. Designed to capture the mesmerizing color contrasts found within the summer time, this stunning eye shadow palette pairs luxurious shimmering khaki tones with a bold floral inspired purple and a luminous orange reflecting the season's solar warmth. The palette's sheer, shimmering metallic and matte shades combine to create multiple elegant, on-trend eye looks. 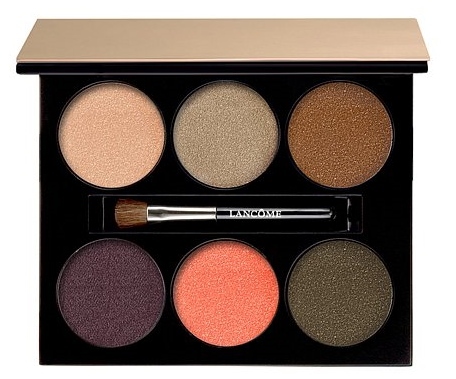 Verdict: The colors in this palette look absolutely gorgeous however I was a little disappointed with the color payoff. The first two colors in the palette (Golden Jubilee & Amazon Moss) barely showed up on my skin and the purple color (Tropical Garden) applied too darkly. I did however love the last 3 colors. The dark gold and green were lovely and the matte coral was a unique shade. I am definitely on the fence with this palette because of its high price tag I would recommend skipping especially since only half of the palette was a hit. An innovative, spray-on nail polish for perfectly polished nails with a never-seen-before technique that evenly and efficiently applies polish in seconds. Paint Can Spray On Nail Polish is perfect for on-the-go nail polish fans. Just spray onto the fingertips and the polish adheres to the base coat or nail polish. To remove any excess polish, quickly wash away from the skin with water or cleansing wipes. You’ll achieve perfectly applied polish instantly. Apply a 2-in-1 base/top coat to your finger nails and allow it to dry. Shake the spray can vigorously and then spray the color onto your nails. Remember to keep the bottle a couple inches away from your nails. Allow the color to dry and then apply the 2-in-1 base/top coat to your nails again and allow them to dry. Finally wash your hands under warm water with soap. The excess color will wash away leaving you with a fabulous manicure. Verdict: I have to admit that I was very excited to try this spray on nail polish. The concept is very innovative and there hasn't been anything like this out in the beauty market until now. Application was easy plus from start to finish, including dry time, the process only took about 5 minutes. I had this polish on for a few days before I finished my review because I wanted to see how long the maincure would stay. My polish chipped immensely after 2 days but before that I thought my nails looked great. Also I wanted to mention that the metallic silver color looked a lot nicer and applied smoother then the creamy pink colors. This is a cool beauty item and I would recommend giving it a try. I wouldn't completly give up doing my nails the "old school way" but this is a fun alternative. * If you would like to pick up one or more of these NAILS INC. Paint Can Spray On Nail Polishs they are currently available in-store & online for $12.00 each at Sephora. Click the link for more details: Sephora The matching Base and Top coat is also available for $8.00. Click here to purchase The Paint Can's Best Friend 2 in 1 Base and Top Coat.